Government is to embark on a systematic review of the salary structure of all public sector workers. This is contained in the new National Public Sector Reform Strategy which was outdoored by President Akufo-Addo in Accra yesterday. Other areas of concern in government’s pursuance of these reforms in the public sector would be in the area of strengthening local government structures and digitization of public sector services and systems. “It would also focus on high level activities aimed at transforming and mainstreaming ICT in government agencies. Apart from this, it would ensure the establishment of an electronic records management system for Ministries, Departments and Agencies (MDAs), and the MMDAs. Ultimately, the public sector will go paperless, and reduce drastically the interface that currently exists between citizens and public servants in the provision of services”, he elaborated. 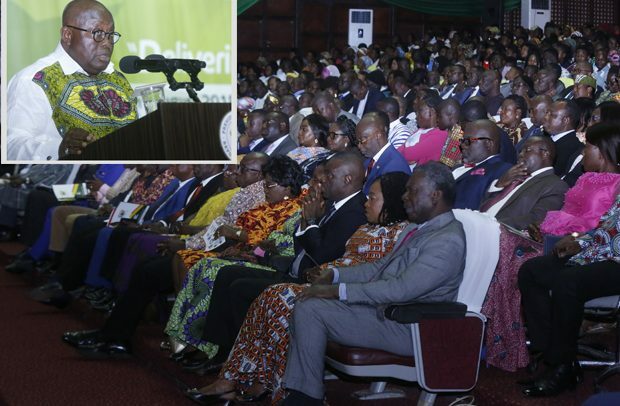 He has therefore urged members of the public service to embrace the reforms, since he believed that they represent effective means for the creation of a public service that would deliver for the citizenry and the private sector.